Pimelea Physodes, the Qualup Bell, is an upright slender shrub that reaches almost one meter in height. It has a spread up to half a meter. 1. Keeping in mind your chosen porcelain shape, sketch a design first. It is always useful to have photographs of the flower in front of you for reference when designing and painting, or if you are lucky the actual flower! 2. 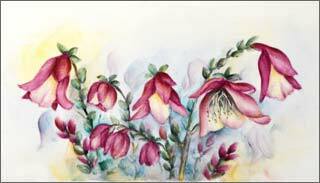 Working from background to foreground of design, paint in foliage and bell flowers. Colours used, magnolia, amercian beauty, derby rose, and three values of greens. Fire. 3. 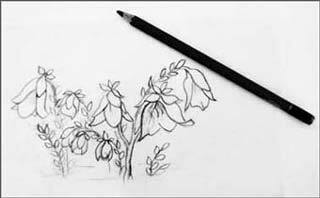 Evaluate your design and add more flowers if required. 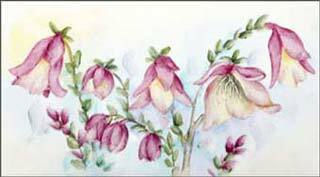 cross-hatch colour into the background - white, meissen blue, warm yellow and a touch of derby rose. Paint in some shadow flowers. Deepen colour on main design. Fire. 4. Strengthen background colour. Concentrate deeper shadow colour behind main design. 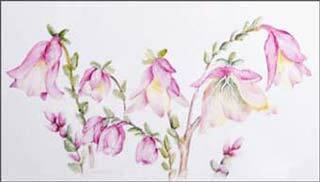 On leaves and flowers add more depth of colour where needed. Finally to achieve more depth to the dark pink shadow area, sparingly shade with Banksia Red or a similar iron red colour. Fire. The Qualup Bell, botanical name Pimelea Physodes, is an upright slender shrub that reaches almost one meter in height. It has a spread up to half a meter. The Qualup Bell produces clusters of striking bell-shaped bracts which surround numerous tiny flowers beneath. The bells range in colour from creamy/yellow, green, red, through to a beautiful and striking rich pink, the colour for which the plant is so well known. 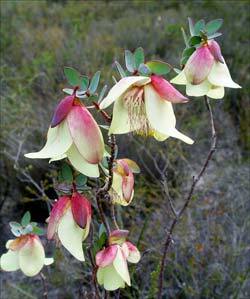 Native to Western Australia and flowering from late winter to early spring, the Qualup Bell is found along the south coast between Albany and Esperance, including the Fitzgerald River National Park. shown: Qualup Bells in the Fitzgerald National Park, W.A. All Photographs are © A Blake 2017.